We have 14 log cottages with PRIVATE SPA & SAUNA ! 3 to 6 bedrooms for 2 to 18 people ! Only 45 min from Montréal ! 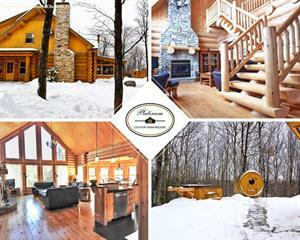 At Platinum Gestion Immobiliere, we offer personalized service for unique cottages in the hearth of the Laurentians, just 45 minutes from Montreal! •	Small cute cottages perfect for 2 people or small groups! •	4 bedrooms cottages with private bathroom in each of the bedrooms! •	5 bedrooms cottages with friendly dining areas for groups! •	Large 6 bedrooms cottages with large kitchens and open spaces for big groups! FULLY EQUIPED COTAGES: washing machine, dryer, dish washer, complete bedding, towels, television, sound system, wifi! ACTIVITIES: Access to a lake, paddle boats and canoes. Hiking trails, cross country skiing and snowshoe trails are accessible from your rental house. We are located in the Laurentians mountains chain, only 15 min away from Saint-Sauveur! Close to many ski station! You can also enjoy a massage in the comfort of your cottage (reservation needed)! Jusqu'au 14 juin 2019 : 25% de RABAIS! Profitez des coûts basse saison incluant une 3e nuit GRATUITE ou un départ tardif GRATUIT!! Please contact us by phone at 514-919-2722. A deposit of 50% of the amount before taxes that will be payed at time of booking via credit card! -	Between 1 and 30 days before the arrival date: no refund. -	Between 31 and 45 days before the arrival date: a refund of 50% of the deposit. -	More than 45 days before the arrival date: a 100% refund of the deposit. -	No refund for the holiday season. A 5% deposit fee will be charged for any cancellation.